BLISTEX has come a long way from the glass pot with the yellow top that I remember (was that Blistex or Carmex? I can't remember but it was a good one). 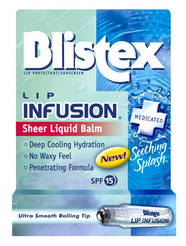 New to the line is their Lip Infusion Sheer Liquid Balm ($2.89 @ walgreens.com). It has all the lip benefiting ingredients you should come to expect: SPF 15, deeply penetrating and this one has no waxy feel to it. What I really like in addition to the minty smell is the roller ball tip that applies just enough of the formula evenly on lips.